Last Sunday (May 27, 2014) we celebrated the installation of two restored windows with a Service of Dedication followed by our Easter pot luck brunch. I thought everyone in the parish might be interested in having a copy of the “service bulletin” for that event and have attached it to this email. We present these stained glass windows as an offering from our parish to the glory of God. Celebrant All things come from you, O God. People And from your own gifts do we give to you. Almighty God, we thank you that you have put it into the hearts of your people to make offerings for the beautification of your church, and have been pleased to accept their gifts. Be with us now and bless us as we dedicate these stained glass windows to your praise and glory; through Jesus Christ our Lord. Amen. I will make your windows of agates, and all your borders of pleasant stones. People How beautiful it is in its brightness. O Lord God, the whole world is filled with the radiance of your glory: Accept our offering of these stained glass windows which we now dedicate to you for the adornment of this place and the inspiration of your people. Grant that as the light shines through in its many colors, so our lives may show forth the beauty of your manifold gifts of grace; through Jesus Christ our Lord. Amen. We are able to dedicate these windows today because of the generosity of our parishioners, the friends of St. Peter’s and Connecticut Trust for Historical Preservation. Gifts large and small provided us with $70,935. These funds were just enough to enable us to restore the two windows we dedicate today and the two that have already been removed by Stained Glass Resources for restoration. When those two windows are reinstalled later this summer, we will have completed Phase 1 of our project. This restoration will extend the life of these windows for another 100 years! 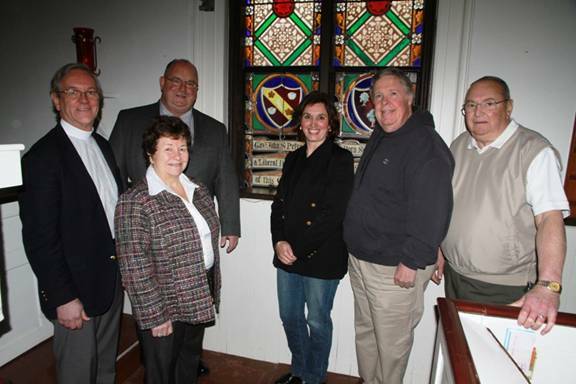 We extend our appreciation to the following: Tom Sayers, Ray Litwin and Sue and John Ostrout who along with me formed the Stained Glass Window Committee for their leadership and dedication to making this happen; Connecticut Trust for Historical Preservation; State Senator Cathy Osten who alerted me back in October to the existence of Connecticut Trust; Hebron Town Manger Andrew Tierney, Hebron Historical Society President Mary-Ellen Gonci and Diocesan Canon for Mission Collaboration and Congregational Life Audrey Scanlan for letters in support of our grant application; to Sue and John Ostrout who drafted and submitted the grant proposal within a short time frame; and to Fred Shay and Stained Glass Resources for their advice, expertise and willingness to help us complete this phase of the project. This truly was a complete parish effort and should give us cause today to celebrate with joy as we gather for worship and a parish brunch to follow.